Play ring toss like never before with this Light Up LED Ring Toss Game! Here at GlowCity we really wanted to take this classic ring toss game to the next level! We wanted to create this game that would be far better than anything glow in the dark. The quality of this light up ring toss game doesn't even compare to traditional glow in the dark games. Everything is battery powered and brightly illuminated using LED lights. You receive two green LED Target Stakes that illuminate very brightly 360 degrees. 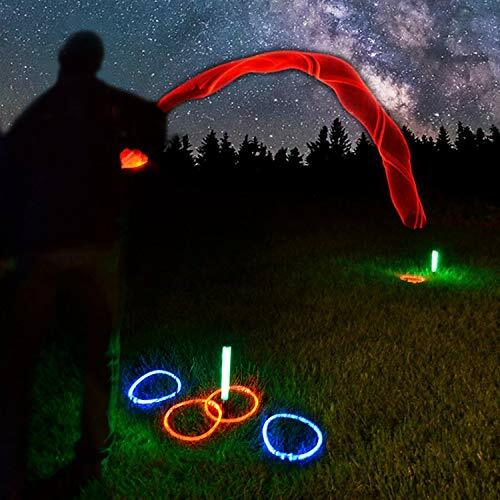 You also will receive 4 Fiber Optic Battery Powered throwing rings (2 Red, 2 Blue) These LED throwing rings look absolutely incredible - its like looking at something out of a movie! When you put it all together you have one epic light up glowing lawn game. We think you will be very happy with the quality of this light up game and hope you enjoy playing it at night! INCLUDES 4 FIBER OPTIC LED THROWING RINGS - You will receive 2 Red, and 2 Blue light up throwing rings that look absolutely awesome! FUN FOR THE WHOLE FAMILY - Developed by GlowCity, we did not cut corners and wanted to create a Premium, High Quality Light Up Ring Toss Game your friends and family can enjoy! Perfect for parties, and celebrations!